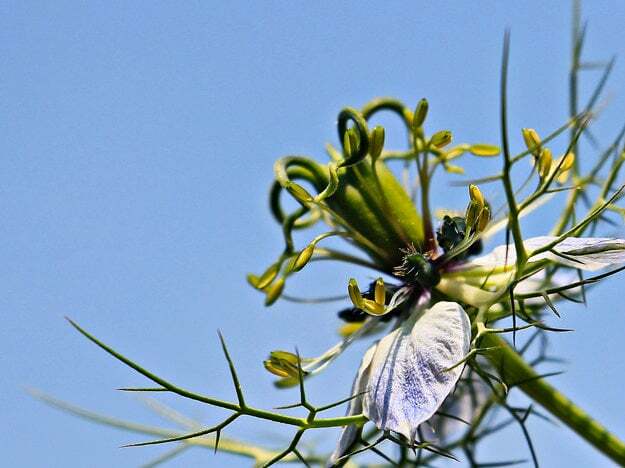 Blemished, impure and irriated skin, in particular, benefit from Black Cumin oil. Needless to say at PURE SKIN FOOD we have included it in our Beauty Oil for Young & Combination Skin. Its balancing and cleansing effects help ease your skin to a clearer and healthier appearance. A volatile component called thymoquinone is mainly responsible for the distinct bioactivity of black seed oil. It is believed that the reason lies in the high and flexible antioxidant efficacy of thymoquinone. The high proportion of linoleic acid in black seed oil prevents dandruff - the fatty acid is a component of the skin barrier. Due to its antimicrobial effect, Black Cumin Seed Oil acts as a mild disinfectant on inflammed skin. But its effect goes much deeper: it stabilizes the immune function of the skin. Up to one-tenth of the skin cells originate from the immune system - if this exhibits an increased responsiveness, it results in allergic reactions such as rashes or eczema. Black Seed Oil relieves associated itching, soothes irritations and promotes healing of tissue injury. Thymoquinone has caught the eye of Cancer Research, so to speak, due to the its ability to regulate the cell cycles, which plays a fundamental role in in the skin barrier. Black Cumin Oil is part of the balanced formulation that makes up the PURE SKIN FOOD Beauty Oil for Young & Combination Skin that facilitates the absorption of active ingredients, providing your skin with sustainable balance to bring it back into its equalibrium.